Over the last few hundred years we as a society have slowly progressed towards the adoption of pharmaceutical grade compounds to enhance health and function. While these compounds have undoubtedly shown some ability to boost various aspects of health, there is suggestion that they also come with some potential downsides. Namely the fact they introduce unnatural chemicals into the human body – which are actually thought to cause health declines with chronic use! With this in mind, we have been on the lookout for some great natural alternatives that can increase health in a completely organic manner – which is exactly where Pueraria Mirifica enters the discussion. This amazing plant (that is also known as White Kwao Krua in certain circles) originates in Thailand, where it has been used for centuries in traditional Taiwanese medicinal practices. In this manner, it was thought to enhance vitality and rejuvenate the body, essential exhibiting an anti-aging effect on the human body. While the Pueraria mirifica is most recognised as a woody plant that climbs rapidly as it grows, the real interest lies within its roots, which are large white tubular structures. You see, these roots contain a number of potent bioactive component known as phytoestrogens, which are a plant-based products that essentially mimic the actio of the hormone estrogen once within the human body. Through this unique action, Pueraria mirifica has been shown to have several interesting health benefits when taken orally. Given the potent action of this amazing compound, we have taken an objective look at the research to clearly determine where it offers us the most benefit. Does Pueraria Mirifica Help Menopause? Given the potent compounds found within this amazing plant essentially mimic the action of estrogen in the human body, it stands to reason that its supplementation will have a rather large and positive effect on female specific health. Taking this into consideration, the supplementation of 200mg per day of Pueraria mirifica by females going through menopause has been shown to cause significant reductions in menopausal symptoms. These include hot flashes, changes in mood, better sleep, and high blood pressure . With this in mind, Pueraria mirifica appears to the perfect option to reduce the severity of menopause symptoms. 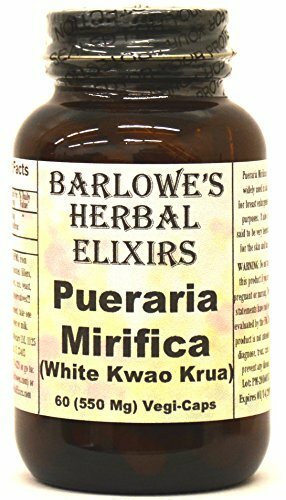 Does Pueraria Mirifica effect Bone Health? Interestingly, there is also evidence showing that the supplementation of Pueraria mirifica can enhance bone health in a very positive manner. In fact, both men and women, supplementing with this amazing compound has been shown to prevent the normal bone deterioration that occurs with age [2, 3]. This suggests that it may be the perfect option to help fight off osteoporosis and age-related declines in bone mineral density. Does Pueraria Mirifica Improve Heart Health? There is evidence to suggest that the regular supplementation of Pueraria mirifica can improve heart and cardiovascular function, while also improving their ability to metabolise fats – thus reducing the accumulation of fats and cholesterol on the veins and the arteries . As a result, Pueraria mirifica appears to be an excellent supplement for those who are at risk of developing cardiovascular disease, or for those who want to stave off heart disease and high blood cholesterol. Does Pueraria Mirifica Improve Cognitive Function? Finally, there is also evidence to suggest that the regular supplementation of this amazing compound can even enhance the health and function of your brain. Its daily consumption has been shown to physically increase the strength of the nervous impulses sent between the neurons in your brain . Through this interaction, it has been suggested to increase both the effectiveness and efficiency of the brain, in which it can lead to improvements in cognitive processing and a reduction in the risk of seeing age-related declines in cognitive function. Given the amazing effects that this great plant can have on health, we wanted to give you some great options that you can start to use immediately! Our first option is this great product by Rachaa Supplements. Renowned for producing high quality herbal supplements, Rachaa have a built an excellent reputation of the back of their great products and their fantastic customer service. Providing a potent dosage of 500mg Pueraria mirifica extract per serve, this is the perfect option to boost health safely and effectively. Much like our previous option by Rachaa, this excellent product by Naang uses fantastic quality ingredients to produce a supplement of the highest quality, in which it provides a potent dosage of 500mg Pueraria mirifica extract per serving. Seriously, you can be assured of both its safety and effectiveness. As an added bonus this great option is very well priced, making it one of the most affordable options on the market. 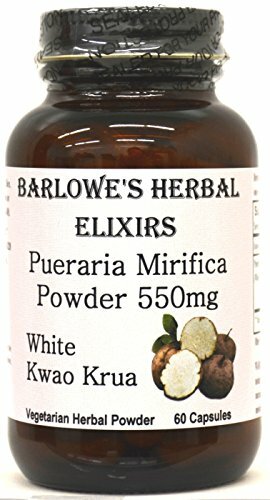 Last but not least we have this great quality Pueraria mirifica supplement by Barlowes Herbal Elixirs. 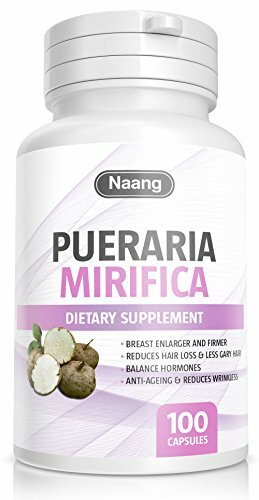 Providing an extremely potent dosage of 550mg Pueraria mirifica extract per serve, this have everything you could need to boost health quickly and effectively – you really cannot go wrong here! 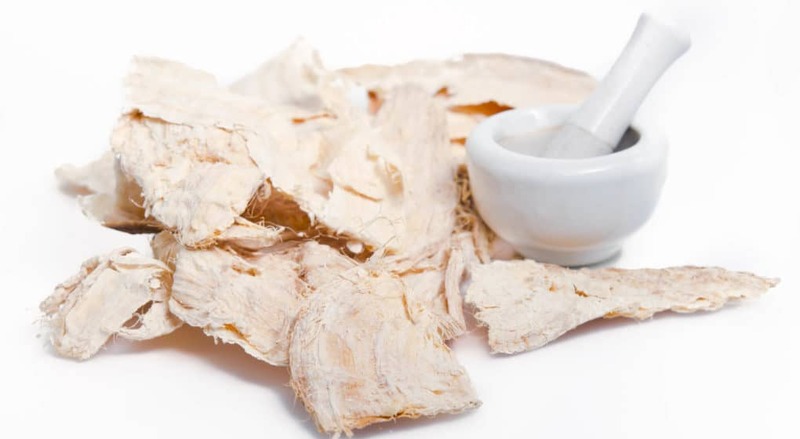 What is the optimal Pueraria Mirifica Dose? Pueraria mirifica is often taken orally in the form of a capsule. Most studies on humans have shown that dosages of between 20mg and 50mg of pure Pueraria Mirifica (which equates to about 200mg – 1000mg of Pueraria Mirifica extract) per day per day can cause improvements in health without any significant toxic effects. As a result, we recommend you commence at 200mg of extract, and slowly increase up to 500mg as you see fit. Does Pueraria Mirifica Have any Side Effects? For the most part, Pueraria mirifica appears to be very well tolerated when taken in the recommended dosages. However, we should note that it should be used with extreme caution by people with hormone-sensitive conditions, as it may cause adverse effects. Moreover, both pregnant and breastfeeding women shouldn't take Pueraria mirifica, as there is limited research demonstrating its safety in these populations. This amazing compound has been shown to have some seriously positive effects on health, which should be of particular interest for those individuals entering the later stages of their life. With the ability to reduce menopausal symptoms, improve cardiovascular health and lower blood cholesterol, stave off osteoporosis and enhance bone health, and even improve cognitive function, it truly is an impressive natural plant. As always, if you have had any experience using this amazing supplement then we would love to hear about it – so please drop us a comment and we will get back to you ASAP!